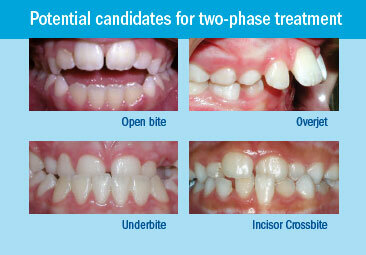 Two-phase orthodontic treatment consists of two separate times when a child receives orthodontic treatment. A first phase of treatment is done while the child still has many or most of their primary or “baby” teeth. A second phase takes place when the child has most or all of their permanent teeth. Braces may or may not be used during a first phase of treatment. Other appliances (the name used for braces and other devices for orthodontic correction) may be used. Your orthodontist has the training and clinical experience necessary to diagnose and treat your child’s orthodontic problem. Orthodontists must complete college requirements, graduate from dental school and successfully complete a minimum of two academic years of study in an orthodontic residency program accredited by the American Dental Association Commission on Dental Accreditation. Only those who have completed this rigorous education may call themselves “orthodontists” and only orthodontists may be members of the American Association of Orthodontists. Why does my child need two-phase treatment? Your child’s orthodontist believes that your child could benefit from two phases of orthodontic treatment, based on an examination of your child’s mouth and study of diagnostic records. The goal of this treatment is to create a better environment for your child’s permanent teeth. Guide the growth of the jaw bones that support the teeth (growth modification). Without this first phase of treatment, your orthodontist has determined that your child’s problem, if left alone, will create an unhealthy environment for the growth and development of your child’s teeth, gums, jaws and face. The treatment will be timed to predictable stages of dental development to provide the greatest potential for improvement and correction of your child’s malocclusion (bad bite). Most patients will require a second phase of treatment, often with traditional braces, to complete the tooth and jaw alignment that was started during the first phase of treatment. How does two-phase treatment benefit my child? A first phase of treatment benefits patients physically, enabling them to bite or chew more effectively. It may reduce the risk of breaking front teeth that protrude. And for many patients, there is improvement in self-esteem. Younger patients may be more cooperative and follow the orthodontist’s instructions on appliance wear and oral hygiene. And the desired changes that result from a first phase treatment may contribute to long-term stability, meaning that teeth stay where the orthodontist has moved them. A second phase of treatment moves permanent teeth into their final positions. 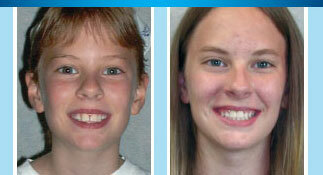 Does a child’s growth affect orthodontic treatment? 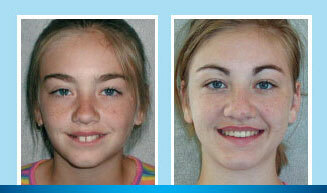 Orthodontic treatment and a child’s growth can complement each other. By timing orthodontic treatment to predictable stages of dental development, the orthodontist may be able to take advantage of your child’s growth and development. Some problems that can be treated quite well in a growing child may require corrective surgery if treated after growth has occurred. A proper relationship of teeth and jaws, so that they work correctly. Correct alignment of the teeth, for a beautiful smile. Positioning of the teeth and jaws for an attractive face and profile. Follow instructions for appliance wear. Keep the appliance, teeth and gums clean by, brushing and flossing as prescribed. 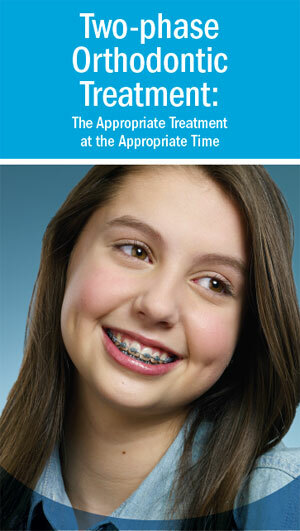 Keep scheduled appointments with the orthodontist. Visit the dentist at least every six months. Avoid food that may damage the appliance. How do I know two-phase treatment is right for my child? Orthodontic care is not a “one size fits all” approach. Each patient has a unique problem that requires a unique treatment plan. What is right for one child may not be right for another. The diagnosis of your child’s problem and the treatment plan are the result of study of your child’s mouth and diagnostic records. To help you achieve it, your orthodontist feels that interproximal reduction, making some of your teeth slightly narrower, will contribute to the successful outcome of your orthodontic treatment. It may also contribute to long-term stability of your results after your braces are removed. Interproximal reduction is the removal of some of the outer tooth surface, called enamel, usually between teeth that touch; it has been used in orthodontics since the 1940s. It is also known as slenderizing, stripping, enamel reduction, reproximation and selective reduction. Whatever the name, the intentions are the same—to acquire more space for your teeth, to bring your teeth into alignment, to improve your bite (the way your teeth come together) or to make the teeth more attractive. Sometimes interproximal reduction is done alone, but it is usually done in combination with orthodontic appliance treatment. Sometimes it is even done in conjunction with tooth extractions. Sometimes it is done following orthodontic treatment to establish stability. Many times front teeth are contoured during or after orthodontic treatment to create a balanced and harmonious appearance of teeth. Your orthodontist will recommend enamel reduction if it is a solution to your individual need. Will interproximal reduction damage my teeth or gums? The health of your teeth and gums is of utmost concern to your orthodontist. Studies among patients who have had interproximal reduction show that the procedure does not make teeth more susceptible to tooth decay. Nor does the procedure predispose gums to gum disease. Occasionally, some patients may experience some sensitivity to hot or cold. Overall, the results are generally positive. Front teeth form the framework upon which lips rest. Evaluating facial characteristics through photographs and x-rays is an essential step in orthodontic treatment. Your orthodontist will examine your facial appearance and decide whether or not interproximal reduction is suitable or beneficial. The primary reason orthodontists choose to perform interproximal reduction on some patients is to reduce the size of the teeth so that they can be aligned properly. Studies among patients who have had interproximal reduction show that the procedure does not make teeth more susceptible to tooth decay nor does it predispose gums to gum disease. How does interproximal reduction work? Your doctor will identify which teeth are to be slenderized. Enamel is removed from the sides of each tooth, where the tooth comes in contact with neighboring teeth. The enamel may be removed manually or with the aid of a speciallydesigned dental handpiece. Your orthodontist carefully removes the desired amount of enamel, leaving each tooth with sufficient enamel to remain healthy and sound. In performing enamel reduction, the doctor carefully creates needed space that will allow teeth to be placed so that the bite is improved and the teeth take on a pleasing appearance. Desired positioning can be achieved after teeth are slenderized. How will my orthodontist decide whether or not I need interproximal reduction? When deciding if reshaping of teeth is to your benefit, your orthodontist will consider such factors as the size and shape of your teeth, their positions and alignment, and your facial features. Front teeth form the framework upon which lips rest, and their positions play an important role in facial appearance. Sometimes the orthodontist may suggest the removal of teeth to enhance the facial appearance. Education and experience in evaluating facial characteristics allow the orthodontist to develop a treatment goal that produces a healthy bite, which can contribute to nice-looking teeth and facial attractiveness. The removal of the enamel generally causes no discomfort for most patients because there are no nerve endings in the outer layer of the tooth. After the teeth have been slenderized, they are smoothed and polished. Your doctor may recommend a topical fluoride treatment, as well as daily use of a fluoride rinse to help the teeth maintain their resistance to decay. How will this procedure help my treatment? Interproximal reduction will help your orthodontist position your teeth for good function and good looks. In some cases, enough space can be created so that teeth do not need to be removed. After your braces are removed, your more slender teeth are more likely to stay where your orthodontist has moved them. It takes many years to become an orthodontist, and the educational requirements are demanding. An orthodontist must complete college requirements before starting a three-to-five-year graduate program at a dental school accredited by the American Dental Association (ADA). After dental school, at least two or three academic years of advanced specialty education at an ADA-accredited orthodontic program are required to be an orthodontist. The demanding program includes advanced education in biomedical, behavioral and basic sciences. The orthodontic student learns the complex skills required to manage tooth movement (orthodontics) and guide facial development (dentofacial orthopedics). The American Association of Orthodontists thanks you for placing your confidence in your orthodontic specialist. If you have any questions or concerns throughout your treatment or in the future, please consult your orthodontic specialist or visit mylifemysmile.org. Orthodontic specialists receive an additional two to three years of specialized education beyond dental school to learn the proper way to align and straighten teeth. Only those who successfully complete this formal education may call themselves “orthodontic specialists,” and only orthodontic specialists can be members of the American Association of Orthodontists.